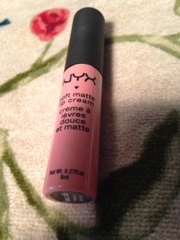 One of the beauty items I got for Christmas was this lovely matte lip cream. I know these are around the 5-6 dollar mark and can be found in places like ulta, and some targets. The packaging is very sleek and the tube is the color of the lip cream and the cap is matte like the finish. I got the shade Istanbul which is on a stick on the bottom of the tube. It untwists to reveal a doe-foot applicator holding the right amount of product. Here is a hand swatch. It seems like a bubble gummy rosey shade. It's light but not pale. I think it would be flattering on all skin tones. It is similar to my natural lip color and very lovely. It has a velvety feel to the lips and even with my very dry lips at the moment it is not accentuating that too much. it's feels nice and not too drying. If you eat it doesn't stain and will completely dissapear. Outside packaging, it is very pretty and metallic. Retails for $49. Sold at ulta and the smashbox website. Is being sold for $39 now. The back is pure silver metallic and had a reflective glare every time I tried to take a picture. It said the products contents and ingredients. Just like the label before it is triangle metallic with mirror like coloring. It does get fingerprints very easily. The width is about the width of my finger. 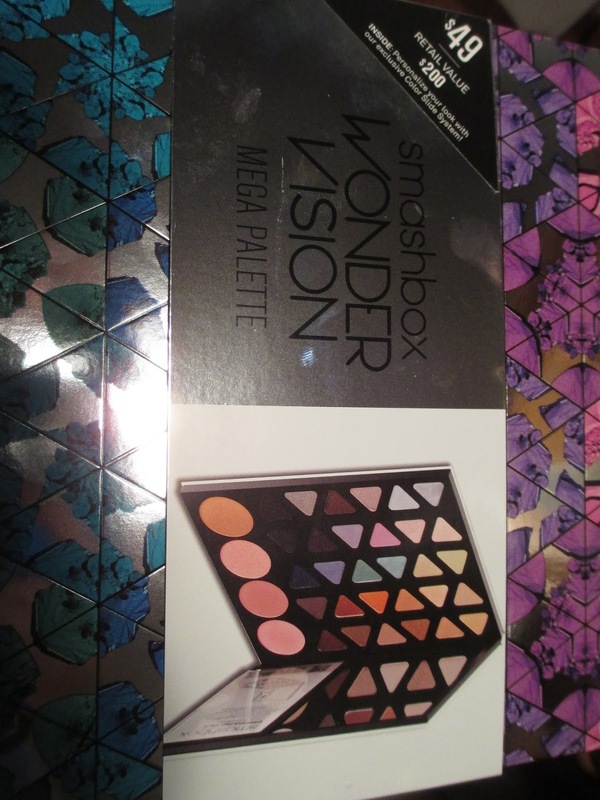 So not a super thin palette but not massive. Also after the first few times opening and closing the magnets seemed to have trouble closing. 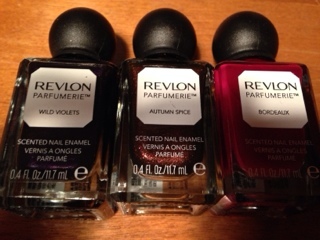 Hey everyone, as you saw in my haul I putchased Three of the new revlon nail enamels. They are a scented line that retails for $5.99 each and I've also seen them in sets of two for $10. I got the shades autumn spice, Wild Violets, and Bordeaux. They come in cute little square jars with round caps. The font and labeling is also very cute. Here are the colors from the side so you can see the colors. The top is wild violets, then autumn spice, then Bordeaux. Even if the cap is weird the brush is just standard not the the "manicure" type polishes just the standard thin brush tip. One thing to note is that the smell doesn't show up until the polish dries, when you open the bottle it smells like regular nail polish. I ended up painting mine in the autumn spice shade, I'm not sure if it complements my skin tone or not. But I really like the color. Hey guys! It's the holiday season full of shopping and presents. I've mostly been buying things for others but some times I accidentay pick up a few things for myself. A few weeks ago I went to walmart but I only bought a few things so I didn't share, but I'll show you know. I got some mini walmart candles! 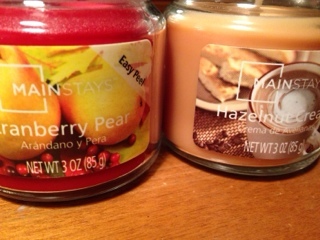 they were only a dollar and they had a great range of fall and winter as well as classic scents. I ran out of my revlon colorstay foundation so I thought I'd try the covergirl outlast( I'm in ivory, about $7). I also decided to get a lippie, this is rimmel Kate moss lasting finish in 17(neutral rosey shade, $4). And another color tattoo this one is bold gold, $6. 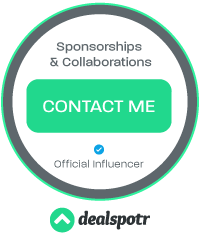 For the last month or so I have been testing out this product. And the reviews look positive! 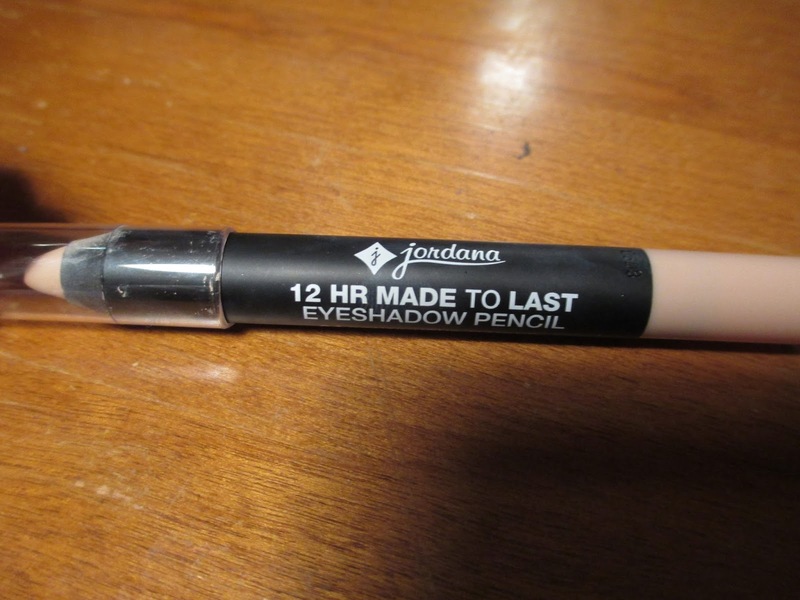 It's about $4 at places where Jordana cosmetics are sold. I bought mine at Walgreens. The packaging is well thought out. You can see the actual color and the finish is matte like the color. These are the claims. Pigmented, matte, long-lasting, and waterproof. Here is a swatch on my hand, it appears very yellowy. Over my eyelid you can hardly see it. But it does leave a semi sticky matte finish and it does cover up some veining. Here is a gold eyeshadow over the pencil(on the top) and the shadow alone(on the bottom).